You may all be familiar with the concept of flash mobs â€” groups appearing suddenly in public, performing, and then, just as quickly as they appeared, disappearing back into the crowd. Recently, the lads from the Vocal Evolution chorus had the chance to stage an awesome flash mob at Karrinyup, a large shopping centre in Perth, WA, which was performed in conjunction with the SIDS WA branch. 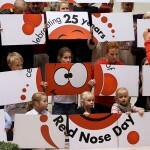 This flash mob is designed to raise money and awareness for Red Nose Day, which helps support research and services for SIDS (or Sudden Infant Death Syndrome). SIDS claims between 120â€“140 babies each year in Australia alone. Each time someone views the clip on YouTube a donation is made by Google ads. The previous flash mob at Karrinyup was viewed over 800,000 times, was in the top ten viewed YouTube clips in Australia last year, and raised many tens of thousands of dollars for a very worthy cause. So, jump onto the following link and support a worthy cause â€“ and enjoy seeing Vocal Evolution surprise the crowd! We want to push this clip past the 1,000,000 views mark, so please send this to all of your friends, colleagues, family and workmates â€“ itâ€™s for a great cause and only takes a couple of moments! To make a donation to help research SIDS and support parents who have tragically lost a baby to SIDS go to www.sidsandkidswa.org. If you want to hear more of our National and Pac-Pacific Champions, Vocal Evolution, buy a CD by going to www.vocalevolution.com/cd/like-a-song.